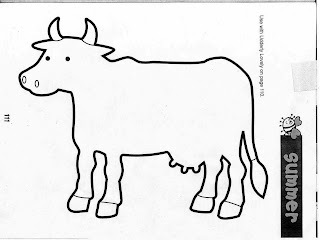 Today I decided to focus on that good old farm animal the cow. I would love to have enough time to focus on one animal a day and at the end of the unit create a farm. Unfortunately, I don't have the luxury of time. We are actually done in the classroom next Thursday. I have two classes left to finish Me Books and Mother's Day activities. We talked about our trip that we took on Tuesday. Most of the children left right from the farm to go home, so we didn't get a chance to discuss our day. 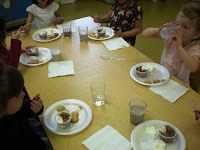 We then talked about what animals from the farm do for us; cows, milk; chickens, eggs; goats, milk; pigs, meat; etc. Then we came back to the cow. 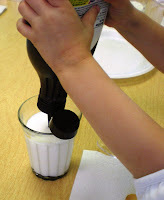 I then asked the children what can be done with milk--new concept for many. I just happened to have a bag of goodies with me to help them along. 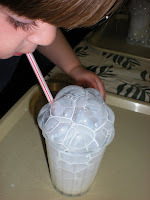 The first thing we did today, was LOADS of fun--we blew bubbles in milk. 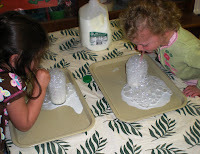 I told them we were making milk volcanoes--this was so much fun, I just hope they don't do it at the dinner table. I then had a very easy craft for them, which took longer than I thought. 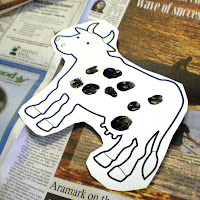 I had a cow from construction paper and I let them put spots on the cow using black paint and their fingerprints. They had more fun with this than I realized they would. Some of the cows even ended up black--along with lots of black hands. They actually turned out cuter than I had envisioned. 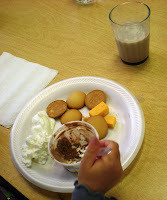 Our last fun with milk was snack time. 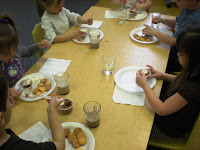 First I let the children make chocolate milk, such fun squeezing and stirring. 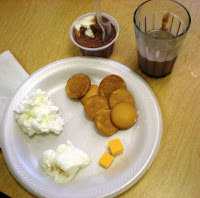 I had then brought in whipped cream, yogurt, cheese, and ice cream. If they wanted whipped cream I helped them squirt some on their plate. Then I let them enjoy whatever milk products they wished. 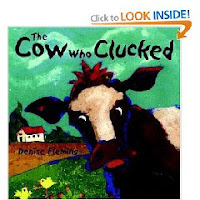 The book we read today was called "The Cow Who Clucked," by Denise Fleming. 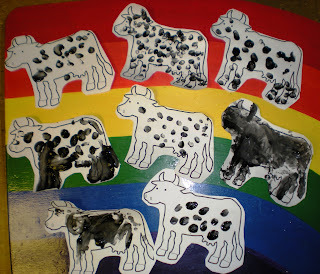 We loved making all the sounds of the animals the cow met as she traveled the farm looking for her moo. We ended our day with finally getting a chance to play outside. It wasn't long enough for my liking, but at least we made it. Oh my goodness....I am so glad I found your blog. I own a dance studio and many of our students are pre-schoolers. I just love your ideas, even though they are not dance related - they are food for thought for me! Thanks for sharing. Please come by and visit my blog - I have a giveaway going on to name my carousel horse and another random giveaway about to start. We just read that book at the library for the first time last week, we LOVED it!! I NEED to buy it. My husband has been singing a song that goes liek this. 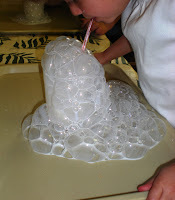 Milk volcanoes - now why didn't I think of that? My kids will love it! 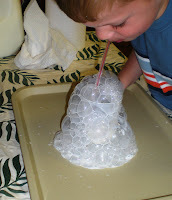 We just made a volcano this week so it's perfect timing. I found your blog through Letters, Numbers and Books Oh My.